Recorded live on 29.10.2015, 20:10 Moscow time. The original Russian transcript is here. Below you can find most of it translated into English. E.SUROV: It's 20:10 Moscow time, Chess-News is on air, Levon Aronian is with us. Good evening, Levon! E.SUROV: The sound quality leaves a lot to be desired. Are you in Berlin now? E.SUROV: You still live in Berlin, don't you? L.ARONIAN: In fact it's hard to say where I've been living. I spend most of my time in Armenia, but, as my parents and my sister with her family live in Berlin, I often stay here as well. E.SUROV: We've got so many questions from our readership via the website as well as via our vkontakte group, and I have to base the interview on those questions. However, I'd like to start with something else. A little more than one and a half year ago, Garry Kasparov, while being interviewed by Chess-News on air, had told us the following: "Only two players are capable of challenging Carlsen - they are Kramnik and Aronian". Some time have passed since then, and I'm already not so sure that Garry Kimovich would have repeated it today. What do you think has happened to you during this period of time? L.ARONIAN: With all due respect to Garry Kimovich as a chess player and a chess theorist, one could note that his opinions change very often. He is a politician, he thinks like a politician, that's why his opinions are very often the ones he considers right just for the time being. What happened to me? Frankly speaking, I don't know it myself. However, if Garry Kimovich says something entirely different in a couple of months or half a year, I won't be surprised. Hopefully, my name will be high enough in his list of people capable of challenging Magnus. E.SUROV: [...] Let's imagine I'm too short-sighted to see more than top 5 players in the FIDE rating list. For more than a year, I haven't seen your name there whenever I looked it up. Where have you disappeared? L.ARONIAN: I haven't disappeared, I have been just playing feebly. It happens sometimes - but now I'm focused on stopping playing feebly. E.SUROV: You know, in general I'm not fond of any kind of reflections, especially on air. But anyways, have you analysed what had caused this recession? L.ARONIAN: There is nothing special to analyse. I have been knowing the cause and struggling with it all along. You know, there are certain details which are hard to understand unless you experience them yourself. The only thing I can say is that while the problem was tiny for the world, for me it was quite substantial. However, it has already gone. E.SUROV: You aren't going to share it with us, are you? L.ARONIAN: You know, it's not about sharing or not sharing it. It is, maybe, about a particular trait of my character that was preventing me from accomplishing my ambitions. And it seems to me that now I have got rid of that. Lately, I might have become wiser and more friendly. At least, I'd like to believe that's so, since I've worked on it. E.SUROV: Do you know there is another opinion about you in this respect? I cant help recalling Garry Kasparov again - please excuse me for mentioning him so often. L.ARONIAN: Why would you excuse? I have great respect for Garry Kimovich, and I'm pleased to hear his opinions about myself. L.ARONIAN: Look what I mean: it's about being more friendly in everyday life and less friendly over the chess board. That's what I'd like to aim at. E.SUROV: Do you think such a combination is possible? L.ARONIAN: I'm not sure but I believe it is. If I didn't hold my own particular opinions about various subjects, I think I wouldn't have been a good chess player. E.SUROV: You say you tried to get rid of that trait of your character, which in fact means you tried to change yourself. Perhaps it's the most difficult thing in our life, isn't it? L.ARONIAN: Well, I can't say it's about changing myself completely, it's rather about making slight corrections. We keep changing throughout our lives, and one of the traits that could change is the degree of aggression. In this respect, we should pattern ourselves a bit, in order to comply with our epoch. That's what I was working on. E.SUROV: Do you follow anyone's example when forming/changing yourself? L.ARONIAN: Sometimes I read books by different sportsmen or art persons, and of course I adopt some of their traits - but only some, without imitating anyone fully. I think no kind of occupation has one-size-fits-all solutions. I'd like to believe it's exactly a personality that gives value to a human being. E.SUROV: I hope Levon has already answered many questions, since there are many similar ones. For example: "How long are you going to stay without the Crown?" L.ARONIAN: Well, one can't get crowned without qualifying for the Candidates first, which I failed to do. Therefore the answer is clear: one should see the Candidates list of players and understand that I have to wait for a while. E.SUROV: The next question is related to the previous one: do you regret not having taken part in the FIDE Grand Prix? Through it, you could have qualified. L.ARONIAN: The thing is that three years ago, as well as four years ago, I did wish to participate in the Grand Prix. There were two of us, quite strong players, who weren't obliged to take part but wanted to do it, just for good sportsmanship. However, if one takes into consideration that the last Grand Prix conditions were, to put it mildly... Well, I would have agreed to play if it were of vital importance for me. By the way, now I might have agreed. But back then... I found the conditions unacceptable, as the prize fund was miserable and the only reason for the participation was to advance to the Candidates. I might have been wrong though. Frankly speaking, I found it quite insulting to compete in a tournament with the first prize half as large as my participation fee at almost any other tournament that time. E.SUROV: Have your starting requirements diminished since then? E.SUROV: Then I'm moving on to another question: "Dear Levon, could you please share your opinion about Magnus Carlsen's chess style, his weak and strong points? What would be your recommendation to the future winner of the Candidates tournament, regarding the preparation for the World Championship match?" L.ARONIAN: As for Magnus's weak points, there are very few. He is a balanced and fundamental player. I think there is one aspect of his play he doesn't pay much attention to, although it might not be exactly "weak". It's his openings, and perhaps double-edged positions as well. These are the territories one should try to beat Magnus. E.SUROV: Another question closely related to the previous one: "Do you know if there is a probability of the Candidates to take place in Yerevan? This would mean you could participate as well". L.ARONIAN: To be honest, I know nothing about it, so I'm just waiting and hoping for the better, as well as my fans. L.ARONIAN: I'm not saying I've deserved it... No, I was playing poorly and I can't say that I deserved to be included into the Candidates. However, there is some hope inside me, because I would feel able to fight for the first place if I played. E.SUROV: Next question: "Do you feel your age while playing? Do you experience extra difficulties while facing young top players, those born after 1990?" L.ARONIAN: I think my age now is kind of intermediate, which means you don't realize not being a youngster anymore, but also don't feel lack of energy or motivation. This is one's golden age, I'd say! E.SUROV: How old are you feeling, then? L.ARONIAN: Hard to say. Perhaps like being 25 or 27 years old. E.SUROV: Still closer to a youngster? L.ARONIAN: Well, my playing style is somewhat adventurous, so I always feel younger than I am. E.SUROV: By the way, let's talk about the adventurous style. One of the questions is whether you are going to change in this respect. Don't you feel it hinders you in fighting for the world title? L.ARONIAN: Perhaps it does hinder me. My friend and tutor Boris Gelfand often tells me this. He thinks my passion for adventures over the board is excessive and becomes my main obstacle on the way to success. But, you know, my Caucasian nature is difficult to change! I know that I will never be able to play pragmatic chess. At the same time, I will never make the moves I don't believe in. That is, my approach towards chess is that I play risky chess, whilst believing that those risks will bring me success. E.SUROV: Levon, let's keep discussing the competition for the World Championship for a while. I'd like to ask you about your cooperation with Magnus Carlsen. First of all, is it true that you have co-worked with him, or have been co-working with him? L.ARONIAN: One could hardly call it a co-working, we have just had a little entertaining training session. It went very cool, I enjoyed it, but, as to me, "co-working" is something else which is hard to achieve between two top players who are each other's rivals. E.SUROV: You know, I was kind of disappointed when I heard about that, because I thought those things were incompatible: you can't really have a training session, even an entertaining one, with someone you want to strip of the World Champion title. I thought it's either one thing or the other. Am I wrong to think this way? L.ARONIAN: Of course, opinions differ, but as for me, I'm a man who doesn't think of my life in terms of chess rivalry only. For example, Boris Gelfand is a friend of mine, and I can easily be a guest in his house while trying to beat him in chess at the same time. The same is often true about other people as well. On the contrary, I'm absolutely okay with that. I am glad to demonstrate my readiness for the rivalry to someone whom I like and feel respect to. It's the same when my opponents are my relatives and close friends. In fact, playing any kind of sport games with my relatives and close friends brings me much more pleasure. That's because I'm a gambler by nature, and I enjoy being able to behave jokingly after I win. E.SUROV: This is what you've said earlier: being friendly in everyday life and a fighter over the chess board? E.SUROV: One more question from our readership: "Every chess player has a tournament of his/her life. Have you already had it? If so, what was it?" L.ARONIAN: As for individual tournaments, perhaps I haven't played it yet, but speaking of team competitions... Our gold at the Olympiad in Istanbul can hardly be compared with anything. There was nothing else of this kind in terms of emotions it brought me. It was such a great pleasure to see the faces of Armenians who came there to support us. As a matter of fact, being an Armenian in Turkey is far from easy. So, when I saw how they were impressed, delighted and proud of their native country, it made me happy! That was a kind of happiness I don't get from chess too often. E.SUROV: If so, then perhaps the World Cup in Baku could have become an individual tournament of your life? L.ARONIAN: Yes, it could. But honestly speaking, it went very difficult for me. Prior to that, I've never had such an experience: I had to be concentrating on my play, while patterning my behaviour and trying to stay calm. For purely emotional reasons, I failed to succeed. E.SUROV: It was difficult for you despite anything, wasn't it? L.ARONIAN: I have to admit it was. E.SUROV: Regarding the Armenian team: I'm sure your fans got tired of waiting, as your team hasn't won anything since the Turkey Olympiad. What do you think is the reason? Does your team need some kind of renewal, or what? L.ARONIAN: We are always close to victory, and I feel our chances for the gold are serious. Obviously, I have never been thinking that just entering the top 3 would be a success for us - we fight exclusively for gold. However, sometimes the things can go wrong. I think it might happen when you strive too hard. Anyway, it seems to me that our current team is a good one, and I hope we will assert ourselves at the European Championship. E.SUROV: Recently your mother wrote a book about you. Regrettably, I haven't read it, but I found a little excerpt of its description in the Internet: "The book opens with recalling Levon's childhood during which he was very fond of fairy tales. He is still fond of them, along with poetry and serious phylosophical literature though. However, when Levon was a schoolboy, each Saturday he would bring to school a new fairy tale composed by himself, to present it at the lessons of non-school reading. Each of those fairy tales was about a young boy turning into a prince because of sorcery". Did you really write fairy tales? L.ARONIAN: To be honest, I don't remember that, but the very idea of magic, and something unearthly in general, appeals to me. E.SUROV: So, do you still enjoy fairy tales, in broad sense? L.ARONIAN: Perhaps I do, but in a slightly different form. I enjoy some symphonies which have fairy-tale leitmotifs. I am fond of watching fiction movies, and of similar literature. One might say I enjoy fairy tales for adults. E.SUROV: Do you know why I spoke about fairy tales? It's because Vassily Ivanchuk, in our recent interview, had also told me how he loves them and keeps reading them. It occurred to me that you might be similar to him in this respect. L.ARONIAN: I think me and Vassily are quite similar in many respects, especially in chess. There are many things in my life I've learned from him. E.SUROV: A question from out Vkontakte group goes exactly like this: "What could you say about Vassily Ivanchuk"? L.ARONIAN: Of course, I can tell a lot, but let me just point out that I am always pleased to play against him. He is a very creative player who can surprise you with a beautiful idea at any moment. E.SUROV: Lately, a chess spectator would nearly always refer to chess engines while watching a tournament game. What do you think about it? You say that you see chess as a human competition, art, creativity. The computer evaluations make it difficult to perceive a game of chess this way, don't they? L.ARONIAN: This is a philosophical question... Our epoch is characterized by the fact that people don't try to use their own brains when thinking about anything. People don't strive to comprehend anything ourselves - nowadays, they got too used to having guidelines. For instance, there is one strange situation I often find myself in: I would watch a movie (because it features one of my favourite actors) and then read a review of this movie. You know, certain websites might have thousands of film reviews, including several dozens of them written by prefessional reviewers. So, I would often find my own opinion about the film completely opposite to the one expressed in the reviews. That's what is happening now, it seems to me: the world has become very fast-paced, and many people don't want to waste their time trying to grasp what is going on. That is, they want to do it without using their own brains. But, as for me, I have enough time for that, in chess and in art alike, so I prefer to think on my own, trying to understand everything in depth. You are right, the engine evaluations are a big disadvantage. The thing is that many people can't perceive chess in all its depth, and as a result they might think that the players are just some idiots. Such people can't understand the real depth of the game, the genius of the best players. E.SUROV: Yes, that's exactly I was talking about. You play a game and consider so many options, while a spectator just sees a move highlighted in red which immediately makes him think: "Why the hell is Levon playing so bad? What's wrong with him"? It hurts, doesn't it? L.ARONIAN: It doesn't hurt me because I understand this perfectly. After all, you know, it's so pleasant to see that your moves are sometimes entirely different from engine suggestions! Meanwhile, human evaluations are often correct, because the engines used by the websites are quite weak. Compared to them, one can look like a real hero who understands chess better than a computer. E.SUROV: Then, tell me please, as a man who enjoys fiction and other unearthly things: are computers able to solve chess? Will the time ever come? L.ARONIAN: I don't quite believe in that. Anyway, it won't happen any sooner as I stop playing and enjoying chess. E.SUROV: Another question goes: "A young American GM Samvel (Armenian for "Samuel" - Ed.) Sevian has been demonstrating pretty good results. What do you think of his chess prospects in the foreseeable future?" L.ARONIAN: Samvel is a very talented player. So far, it's hard to understand what his limit is, if there is any. Everything depends on how he will manage to build up his character, his intelligence. As to his chess abilities, of course they are striking, and surely he will become a strong player. E.SUROV: Once again, you've touched upon an extremely interesting topic. Does one need to develop a strong personality if one wants to be a top level GM? It seems to me that almost all of the world top 10 players have prominent personalities, except maybe one or two of them. L.ARONIAN: Yes, I think it is needed. You cannot become a great chess player before you get into some kind of a conflict with the common opinion, or with the players of the past and their concepts. It's very important to believe in your own opinion, that's what I mean. And indeed, one can notice that all of the players who achieve anything significant, who win tournaments - all of them have strong personalities. My sincere opinion is that this factor is of huge importance. E.SUROV: Thanks! One of our followers wants you to name three best chess books. L.ARONIAN: It's hard to name "the best books". I'd rather name my favourite ones. First of all, there is a book I enjoy, let me recall its title... perhaps it's Secrets of a Chess Composer by Kasparian, in which he tells the readers how he composed his studies. This is the book I love, please excuse me for not remembering its title. (Secrets of a Study Composer, published in Russian in 1981 - Ed.) This is a tremendous book about the process of composing studies. Another book I love is Into the Fire of Attack by Tal and Damsky (it seems to have been translated into English under the title Attack with Mikhail Tal - Ed.). It's also magnificent. Besides, I enjoy Seven Deadly Chess Sins by Jonathan Rowson. It's a very atypical book which raises extremely important topics. I think that if a world-class GM studies it well, he/she could get a kind of a manual on psychological struggle at the top level. E.SUROV: Regrettably, I haven't read the book by Rowson, but let me ask you: are you a "sinner" yourself? Do you commit any chess sins? L.ARONIAN: Probably it's my excessive self-confidence. Sometimes I do commit this sin. E.SUROV: Now there's a question about cheating: "What do you think of this problem? How serious is the issue of cheating now? Does it occur at your level, that is at the very top?" L.ARONIAN: As to me, I suppose that the problem is not as grave as it's usually perceived. Many people think everyone is a cheater who just awaits a good moment to cheat. The issue has been exaggerated. In fact, we don't have a lot of cheating going on, especially comparing chess with other kinds of sports. Of course the problem does exist, but I haven't seen it yet at the top level. I think that half measures would be enough to handle it. I don't see any point in giving way to total panic, since around 90% of the cheaters get caught anyway. E.SUROV: Another question goes: "What time control do you consider the most suitable for classic chess, regarding the World Championship?" Apart from that, the author of the question wonders what you think about the Zurich Chess Challenge, since its next edition has an unusual time control and you will be playing there. The organizers present it as "neoclassical chess". What is your opinion about all this? L.ARONIAN: I have to admit that Oleg Skvortsov is a distinctive person who is fond of inventing something. So far, it's hard to talk about it, as I haven't tried it yet. It would be very interesting to check it in practice. As for me, I like when a game lasts 5 or 6 hours. I'm not that fond of long games. E.SUROV: But nowadays the game that lasts 6 hours is extremely long, isn't it?! L.ARONIAN: I'm not that fond of having a single time control for the whole game. No, I don't like it. I think there should be a moment during a game when the players get additional time, just to be able to stand up, go and refresh themselves. However, I also don't like a very long time control when everything heaps up. Regarding the time control, my position is balanced. Anyway, we'll see. The practice of people trying to organize tournaments with shorter time controls seems inevitable to me. In our time, it's going to be like this. E.SUROV: "You have repeatedly won the World Championship in Fischer random. What do you think about the prospects of this kind of chess?" Andrey Deviatkin asked this question. L.ARONIAN: You know, chess players can't do a lot to promote it on their own. It requires a lot of time and money, both of which we don't possess. However, Fischer random chess is one of my favourite games. If Fischer random tournaments did exist, if their dates were suitable, if they allowed me to make provision for my family, then I would be glad to play each Fischer random competition I ever could. E.SUROV: Would you do that even if Fischer random chess totally replaced traditional one? L.ARONIAN: Well, you are talking about some paradise! E.SUROV: This is the answer too! Perhaps that's exactly what you have been expected to reply. So, do you mean that playing only Fischer random would be a paradise? E.SUROV: Well, then the next question is about the Sicilian. "According to databases, you used to play it as Black quite often before 2005", Anton Lavrentiev asks. "In the introduction to the Winning with the Najdorf Sicilian by Zaven Andriasian, you say that the book is so good that it made you think of playing the Najdorf yourself. Have you changed your mind?" L.ARONIAN: What can I say? The Marshall is good enough for me to bring home the bacon! L.ARONIAN: You know, the Sicilian is the opening where one has to lose at least some five games just to understand what is going on, to start feeling the positions. E.SUROV: And you don't want to lose, do you? L.ARONIAN: Well, losing five games a year is my usual limit. It wouldn't be very rational from the economic point of view. E.SUROV: It seems you always think in economic terms, Levon. L.ARONIAN: Because I have a big family. L.ARONIAN: All those things are related to each other. I don't think that great composers, painters, or film directors created their masterpieces for the sake of art only. Everything is interconnected. E.SUROV: "What do you think about women's chess? ", Elena Tomilova wonders. "Have you seen interesting ideas or novelties in women's games, even if only once"? L.ARONIAN: To be honest, I follow women's chess quite seldom. However, in my opinion, women should compete against men. This has always been my firm belief. I'm convinced that women can be equal to men in chess. 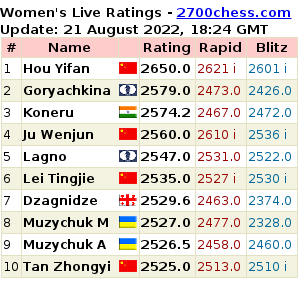 So, first of all so-called "women's chess" should be abolished, and then we will have a real lot of good female players. E.SUROV: Do you mean that women are hindered by playing just each other and stewing in their own juice? L.ARONIAN: Yes, I sincerely think so. E.SUROV: Well, thanks a lot! We were talking to Levon Aronian who tries to alter his personality and promises to return to fighting for the World Championship soon. L.ARONIAN: Yes. I swear it! E.SUROV: Oh, we've taken you at your word! We'll be checking up on you.